I'm always looking for products that are unique and different. June Jacobs Radiant Refining Exfoliating Powder is one such product. This unique exfoliating powder activates upon contact with water and gently sweeps away dead skin cells with rice, bamboo, papain and salicylic acid. Natural brightening ingredients, lemon peel, bearberry root, mulberry root and licorice extract help balance overall skin tone, while tea tree oil and willow bark extract help absorb oil. Skin's texture and tone is refined and left soft, smooth and clarified with a radiant finish. 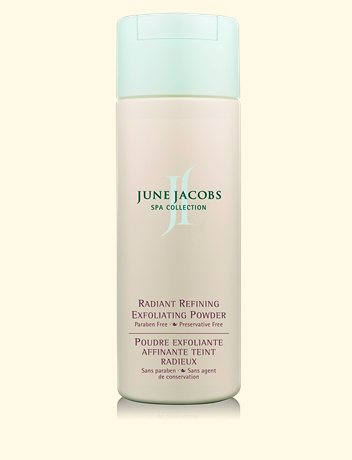 And now I'm offering one winner the chance to receive a bottle of June Jacobs Radiant Refining Exfoliating Powder, valued at $52! To enter, place your name and email address in the box below. The winner will be selected on Wednesday, August 18 and notified by email. This giveaway is open to US residents only. Giveaway runs until Tuesday, August 17 at midnight. One entry per person, email address and IP address. Multiple entries will be disqualified.